UNITED STATES: A NextEra wind-turbine maintenance worker has been killed while working on a project in Iowa. According to a statement released by the local sheriffs office, the worker fell while inside the tower of the Clipper Windpower 2.5MW Liberty turbine located at the Endeavor wind centre. Reports say he fell over 60 feet. The reasons behind the accident are unknown and are still being investigated. It is unknown whether the turbine was fitted with a lift. 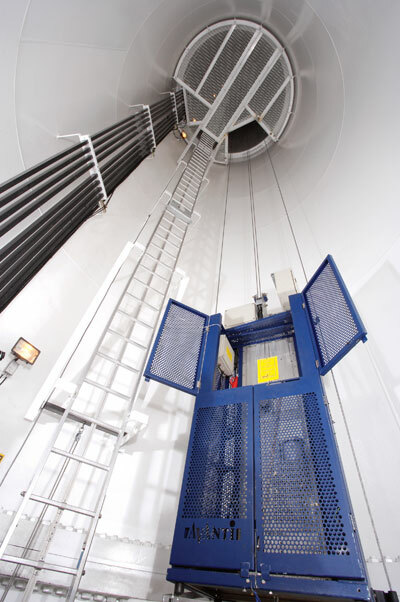 According to Clipper's latest marketing material, the Liberty turbine comes with a two-person service lift (see below). Lifts are not mandatory. However, some manufacturers such as RES are looking at retrofitting them. Their use reduces wear and tear on joints from climbing up ladders, as well as fatigue, so mistakes are less likely. According to Windpower Monthly’s special report on Health and Safety, serious accidents while working on or installing turbines is on the decline. In the US, seven people were killed in the wind industry between 1981-85, making up 7.27 per GW of installed capacity. There were the same number of fatalities between 2006-10 but the ratio per GW declined to 0.12.